PROFESSIONAL: Like many people I have worked in a number of industries including construction, farming, retail, education and business. I like learning and sharing what I learn. 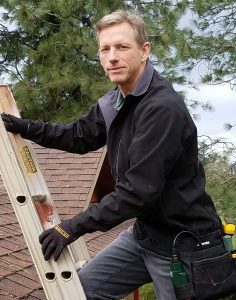 Having experience in general construction, residential foundations, framing, roofing, and renovation work, I trained as a home inspector with a local company for six months before becoming certified with InterNACHI and passing the National Home Inspector exam required by the Oregon Contractors’ Board. I enjoy investigating structures and providing relevant information to my clients. REVIEWS: With each inspection, I ask clients for feedback to continually improve my service. PERSONAL: When I’m not working, I enjoy landscaping my property and renovating home projects. Since my daughters left for college, my wife and I are enjoying more road trips. I like outdoor sports and workout just enough to enjoy hiking and adventure with friends. I consider myself extremely blessed and try to share those blessings by serving in children’s ministries at my church. My wife and I also support a number of local ministries that help people in need. Safe Families for Children is a network of volunteer host families that extends the community safety net to help parents and families in need. Union Gospel Mission provides compassionate care for thousands of men, women and children Each year in Salem-Keizer. Hope Pregnancy Clinic serves Marion and Polk Counties by empowering individuals to make healthy, life-affirming choices regarding sexuality, pregnancy, parenting and adoption.